These intensely buttery and flaky hand pies are like a posh man’s McDonalds apple pie. If you read the recipe ahead and bake them over two days though, they can be enjoyed by anyone. And they darn well should be, because nobody should be subjected to applesauce that tastes like wall glue. Notes: as the apples are cooked down, it doesn’t matter which apples you choose for this recipe, just go for the ones that you believe have the best flavour. Put the flour, sugar, salt and cubed butter in a food processor and pulse until breadcrumbs form. Before it forms a ball, slowly add the water – add a little extra if it feels dry, pulse until dough forms. Pat the dough into a ball, wrap in cling film and refrigerate for 30 minutes, preferably overnight. Make the filling. Combine all ingredients in a large heavy bottomed saucepan. Cook over medium heat and stir every so often. The apples will start to break down and will eventually reach a saucy consistency. Cook for 45 minutes and mash up unbroken pieces of apple. Reduce heat to medium-low and continue to cook for 2 hours until the sauce is much darker, thicker and half the amount. Transfer to a jar and let cool to room temperature and then refrigerate, will last there for 1 month or up to 6 months in the freezer. On a lightly floured surface, roll the dough out a ¼ inch thick. Take a 4/5 inch cookie cutter and cut out as many rounds as you can, you should have about 16. Place the rounds on a baking tray, cover and refrigerate for 30 minutes. 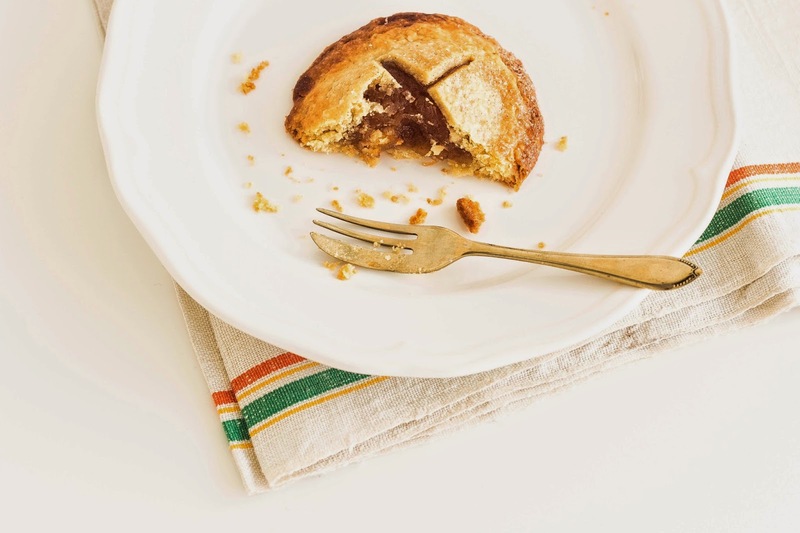 Spoon 1 ½ teaspoons of apple butter in the centre of half the rounds, making sure to leave a 1/2 inch gap between the edges of the pastry. Brush water around the edges of rounds and place another round on top. 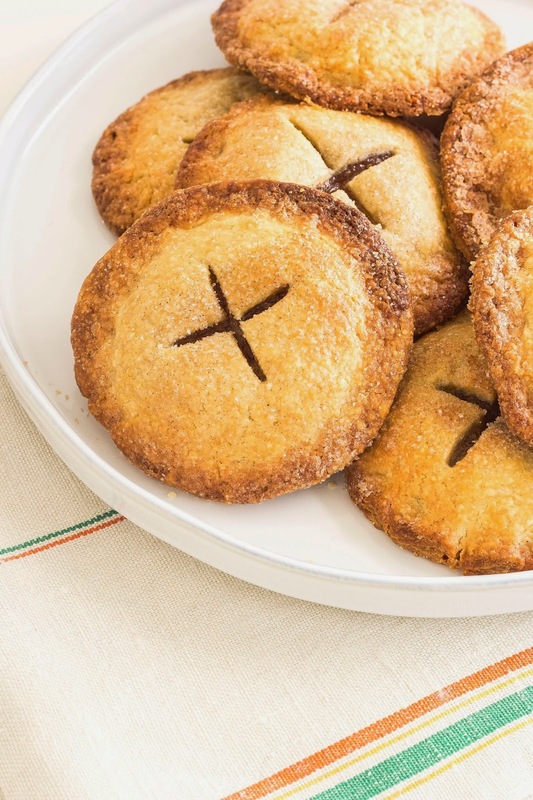 Gently seal the dough with your fingers and create a cross in the centre using a knife. Repeat with the rest of the rounds. Place back on baking sheet, cover and and refrigerate for 30 minutes. Preheat the oven to 180 C. Combine cinnamon and sugar in a small bowl. 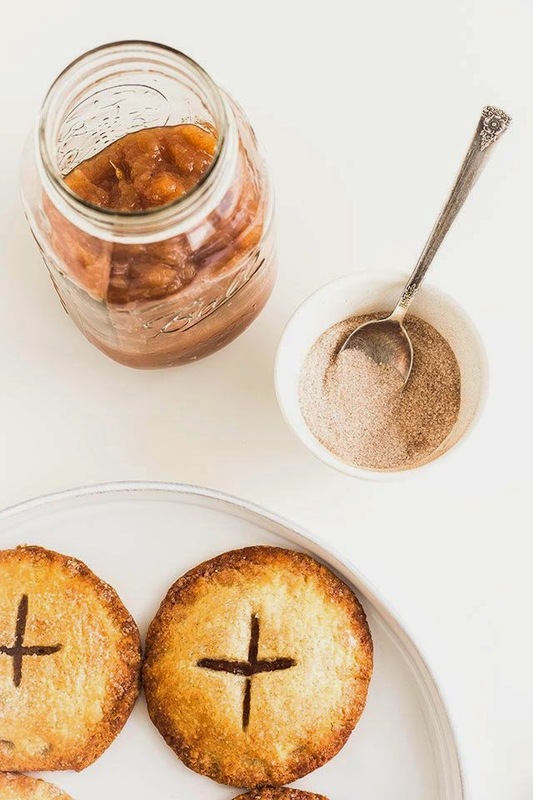 Brush pies with water and then sprinkle with cinnamon before baking. Bake for 22 minutes until lightly browned. Let cool or eat warm, lasts for 3 months in the freezer or 4 days at room temperature. There’s nothing worse than being at a party while the host is slaving away in the kitchen – particularly if you’re the host! That’s why today we have an easy Berry Tart recipe for you, that uses *gasp* shop-bought pastry. We don’t mind a shop-bought pastry, particularly when it makes something so delish! The great thing about this tart is that once you have the base (mainly berries) you can add whatever you’ve got in the cupboard. Here we’ve added chocolate (a gooey caramel, nougat & chocolate combo) and coconut. Oh and a sprig of mint to freshen it up, seeing as it’s spring. Chosen toppings e.g chocolate, coconut, mint. In a large bowl mix together the berries, sugar, cornflour and salt. Roll out the pastry to 8mm thick. Cut into rounds and place the berry mixture in the middle. Add your toppings to ‘spice’ things up. Fold the edges in and brush with egg white. Bake for 30 minutes or until the pastry is golden and the berries are bubbling. These tarts are a perfect spring treat and so easy to make. Now you can pop them in the freezer until the day of your party, then defrost and enjoy yourself! Ginger spiced toffee sauce and buttery apples come together to give this classic dessert a modern twist! - First make the pastry. To do this, rub the butter into the flour until the mixture resembled breadcrumbs. Next add the water a tablespoon at a time, mixing with a knife until the pastry starts to come together – you might not need to add all the water for this to happen. Now use your hands to bring the pastry together in a ball, wrap in clingfilm and chill in the fridge for 30 minutes. - While the pastry chills, peel and core the apples. Cut into rough 1cm chunks and toss in a bowl with the cinnamon, sugar and a little lemon juice to prevent them from browning. Melt a knob of butter in a deep frying pan over a medium heat and add the apples, cooking for about 10 minutes, or until they begin to soften. Take off the heat and drain away any juice or butter left in the pan. - Next make the toffee sauce. Simply put all the sauce ingredients into a saucepan and melt over a medium heat. When the mixture starts to bubble, leave to simmer for 5 minutes, stirring gently. When the sauce starts to thicken, remove from the heat and leave to one side to cool slightly. - Preheat the oven to 200ºC. Take the pastry out of the fridge and roll out on a floured surface until ½ cm thick then use to line a lightly buttered pie dish. Add the apples and drizzle a couple of tablespoons of toffee sauce over the top, putting the leftover sauce to one side to serve. Now roll out the pastry for the pie lid and gently place on top of the pie. 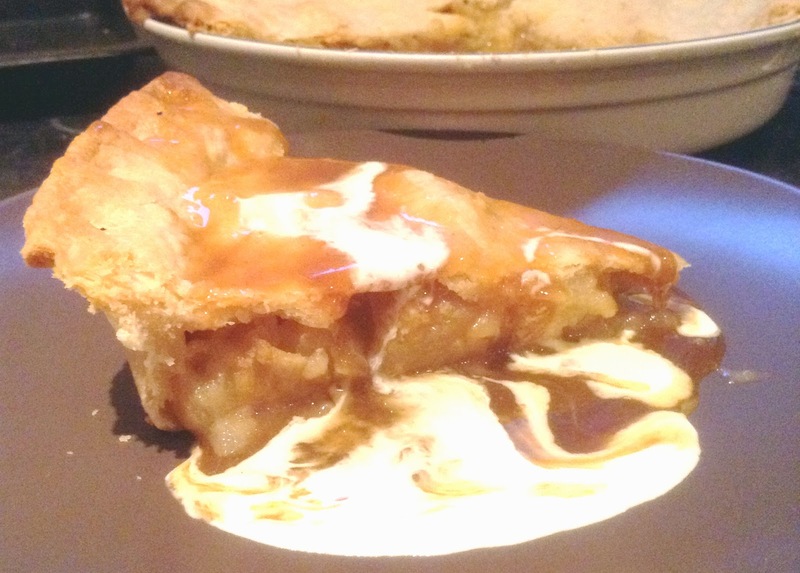 Cut two small air holes in the middle of the pie and use any leftover pastry for decoration. Using short downward strokes and a sharp knife cut any leftover pastry away and pinch together the lid and base to create a firm seal. - Place in the oven for 15 minutes, then turn down the heat to 180ºC and bake for a further 30 minutes, or until the pastry on top is golden and the filling soft and bubbling. Serve with a generous drizzling of toffee sauce and double cream. Delicious! 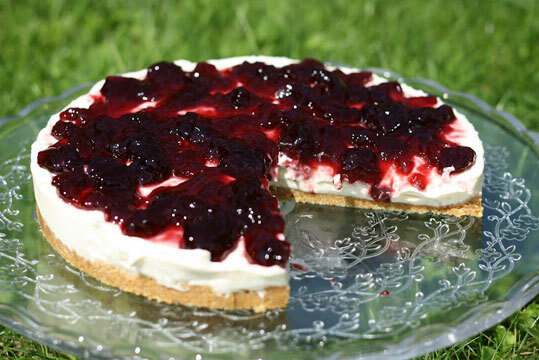 Kick the dreary winter blues out with this delicious cherry, chocolately and lime-drizzled cheesecake! - Eat when ready to be demolished – yum yum! Our childhood memories of trick or treat may have long gone but the Cellardoor girls think that life would be very dull without a good dose of sugar and Halloween fun!! 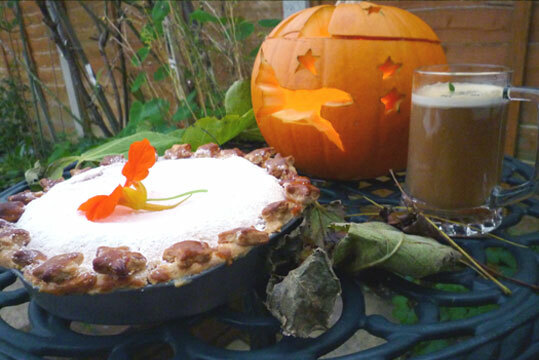 If you like custard tart this sweetly spiced pumpkin pie will certainly tickle your taste buds – and in view of the occasion we’ve also carved our own Unicorn pumpkin! Please do share your creative treats and carvings – we’d love to see them! !